With the price of Bitcoin approaching a 6-month low, there’s been a lot of uncertainty about the whole cryptocoin movement, and it seems Apple is dealing cryptocurrencies another blow by banning mining apps from the iOS App Store. Now, for anyone who has tried to mine their own cryptocoins, the idea of using a phone — even one as powerful as the iPhone X — for mining might seem kind of silly, as a graphics card from AMD or Nvidia would do the job significantly better for much less money. Instead, the goal of Apple’s new policy appears to be preventing iOS apps (and malicious developers) from damaging devices by drawing too much power or creating excessive heat with processes that mine cryptocoins in the background. 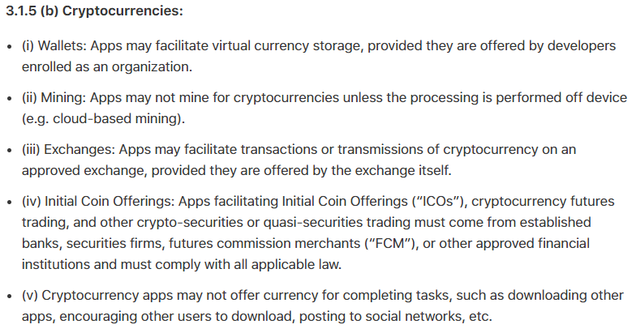 However, the addition of section 3.1.5 (b) has introduced a few more rules for what can and can’t be done in relation to cryptocurrencies on iOS devices. The move by Apple mirrors policies instituted by Google in Chrome that banned all cryptocurrency mining extensions from the Chrome Store. Additionally, apps facilitating initial coin offerings must come from established banks, securities firms or FCMs, and must comply with all local laws. And finally, cryptocurrency apps will not be allowed to offer users coins for performing various tasks inside an app, like asking the user to review the app or post about it on social media. In short, users should still be able to use their iPhones to track, trade, and store cryptocoins without any problems. But if you’re an app dev who is trying to earn a little extra money by using people’s iPhone’s to mine coins for you in the background, don’t be surprised when your app gets pulled from the store.